It must be an existential problem, doesn’t it? I mean, not quite as existential as which came first, the chicken or the egg, but knowing when to quit or if quitting is ever an option is a situation we’ve all wrestled with. 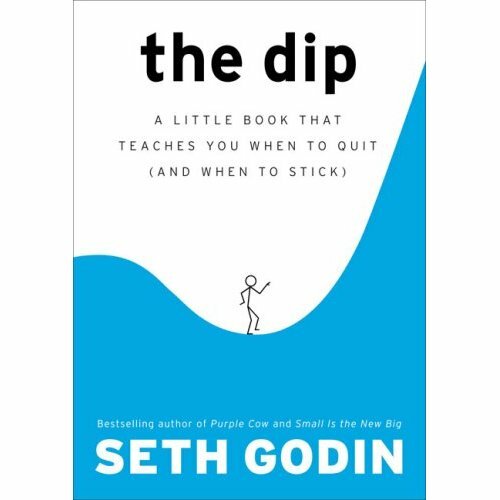 Earlier this week, a good friend of mine, Steven Plaat, handed me a book by Seth Godin entitled The Dip. I’d only red the cover and already loved it! I am a fan of critical thinking – I mean CRITICAL thinking – I appreciate luck but I don’t believe in it. I think we are way too intelligent as humans to leave it all (or even part of it) up to invisible “people”. Reading The Dip was a great reminder of who I am and who I want to be as a person. I’m writing below my favorite lines of the book. It’s taken some time but I did it for us – so go ahead read them and hopefully they add value in your life or spark a new fire in your ambitions. Sometimes we get discouraged and turn to inspirational writing, like stuff from Vince Lombardi: “Quitters never win and winners never quit.” Bad advice. Winners quit all the time. They just quit the right stuff at the right time. Zipf’s law – (Source: Wikipedia) an empirical law formulated using mathematical statistics, refers to the fact that many types of data studied in the physical and social sciences can be approximated with a Zipfian distribution, one of a family of related discrete power law probability distributions. The law is named after the American linguist George Kingsley Zipf (1902–1950), who first proposed it (Zipf 1935, 1949), though the French stenographer Jean-Baptiste Estoup (1868-1950) appears to have noticed the regularity before Zipf. Only talented people fret about mediocrity. The Dip is the long slog between starting and mastery. Successful people don’t just ride out the Dip […] they push harder, changing the rules as they go. Stick with the Dips that are likely to pan out, and quit the Cul-de-Sacs to focus your resources. If it doesn’t cost you your life, it isn’t a quest. it is easier to be mediocre than it is to confront reality and quit. The next time you catch yourself being average when feel like quitting, realize you have only two good choices: Quit or be exceptional. Average is for losers. The opposite of quitting isn’t “waiting around.” No, the opposite of quitting is rededication. The opposite of quitting is an invigorated new strategy designed to break the problem apart. The smartest people are realistic about not imagining light (at the end of the tunnel) when there isn’t any. If you’re not going to get to #1, you might as well quit now. Quitting is not the same as failing. Coping is a lousy alternative to quitting. Quitting as a short-term strategy is a bad idea. Quitting as a long-term strategy is an excellent idea. It’s almost impossible to overinvest in becoming the market leader. The Dip is a great book and a short read. I highly recommend it to anyone of you faced in a “To Quit or Not Quit – That is the question” situation or perhaps someone you know could use the help. Now go out there and conquer the DIP!